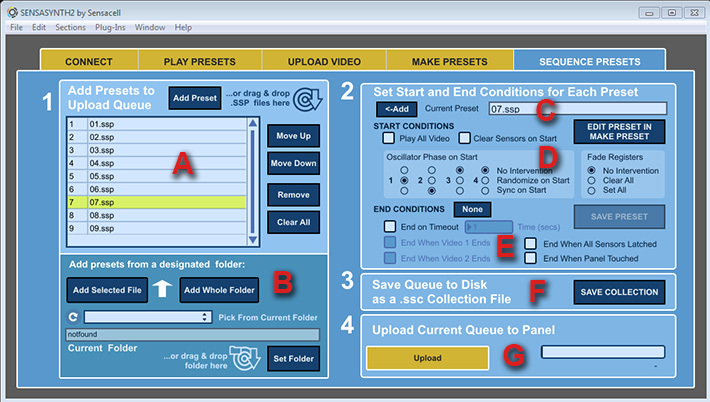 The final step to preparing a Sensacell panel for a “standalone’ installation (one that runs without being controlled by an external PC) is generally to take a series of presets, organize them into a playback order, add Start and End Conditions for the transitions between the presets, then upload this “queue” to the panel. You can then shutdown SensaSynth2, disconnect your PC from the panel, and the Preset Sequence will play on its own. Furthermore, any time the panel is re-booted (powered up), it will begin to play the sequence without any external control. The sections below take you step by step through building an Upload Queue, setting the Start and End Conditions, and uploading the queue to your panel. The first step is to populate this Upload Queue with the presets you want to upload to your panel. There are several ways to do this. The simplest way is to click the Add Preset button and use standard Windows Open Dialog box to locate the .ssp Preset file you would like to add next. The Preset is then appended to the bottom of the list. A much faster way is to open the Presets in Windows Explorer, select a group of them and drag and drop them onto the Upload Queue. A final way is to open a folder, using the interface described in the next sub-section, and to populate the Queue from there. At any time you can use the buttons to the right of the Queue to re-order the Presets, or to remove one or all of the Presets currently in the Queue. Clicking on a Preset asserts that Preset temporarily on your Sensacell panel, the same way that opening the Preset would in the Make Presets section. This is a easy way to preview a set of Presets quickly. Selecting a Preset in this way also designates the currently set Preset as the target of the Move and Remove buttons immediately to the right, but also the Start and End Condition settings further to the right. Another way to load Presets into the Upload Queue is to identify a folder using the interface at the bottom of this block. If you have organized your Presets into a particular folder on your hard drive you can load that whole folder here. Select the Set Folder button or drag and drop a folder from Windows Explorer into this area to select it. The file path is displayed in a text field and a pop-up menu is populated with all the valid .ssp files in the selected folder. You can then upload the whole folder or use the pop-up menu to designate a file, then use the Add Selected File button to append it to the Upload Queue. At the top of the #2 box, the current preset is identified in a text field. If you have just navigated to this section from another part of the program, the current Preset remains what it was in the previous section. You may in that case intend to upload that Preset to the Queue, which you can do easily with the Add button. When you add a Preset to the Queue, or click on an already added Preset in the Queue, that Preset becomes the current one. Start Conditions are events that are processed once immediately when a new Preset is loaded. Play All Video. When this flag is set the Start and End Frame values, generally set in the Video Parameters section, are ignored and every frame of the uploaded video is used. While this overrides the ability to play a designated clip or subsection of some specifically uploaded video content it does ensure that the Start and End Frames used are actually within range of the currently uploaded content (which can be changed at will without changing the Preset). Clear All Sensors. Designates all sensors as cleared (or “untriggered”) when the Preset starts. While any sensor that is “actively” being triggered (is being touched through the preset transition, for example) will immediately re-trigger, sensors that are “designated” as set (or “triggered”) as a result of one of the Trigger Modes (like the Toggle and Latch Modes, where a sensor can stay triggered even when interaction has stopped ), will clear and stay cleared until re-activated. Oscillator Phase on Start. When a Sensacell panel is restarted, the 4 discrete Oscillator signal sources begin with all the LED pixels oscillating in sync. An ongoing function introduces occasional small timing variations into the oscillation cycles calculated for each pixel so that the oscillation phases soon become randomized across the panel. You can use the options here to interfere with this process when a Preset first loads by electing to do a separate one-time randomization to kick start the appearance of randomness (choose Randomize on Start) or by re-asserting the initial sync so they start oscillating together before drifting apart (choose Sync On Start). Fade Registers. If an LED pixel is actively in the process of fading in or out when a new Preset is loaded, and the default value of No Intervention is set here, the fade continues without interruption, although the “destination” values for the fade, as well as the fade timing, become those of the new Preset. Alternately, you can set or clear the Fade Registers, forcing the current fade to restart or finish, as a one-time initialization event when the Preset loads. This can create some interesting special effects you can experiment with. End Conditions determine when a Preset ends and the next Preset loads. If no conditions are set then the Preset will play indefinitely or until it is “manually” changed using the controls in the Play Presets section or through another method like Dial-A-Preset or Contact Closure. The conditions are not mutually exclusive, however; the Preset will end when the first condition is met EXCEPT when End When Video 1 (or Video 2 ) Ends are selected and a Timeout is also set. Then the Timeout first plays out and then the Preset ends at the end of the next loop of the video. End On Timeout. When the Preset is loaded a timer starts and when it times out the Preset transitions to the next one. End When Video 1 (or 2) Ends. The Preset will transition to the next one when the End Frame of the designated video plays. End When all Sensors Are Latched. Most useful when using the Trigger mode called Latch Mode, where sensors stay latched once set. End When Panel Touched. Triggering a sensor activates the next Preset. You can use this to encapsulate your entire Upload Queue into a single file that is easy to re-upload to your panel. The Preset data for each Preset in the Upload Queue, including all the start and end conditions, is saved to disk with the .ssc extension. This captures all the data in each Preset as it currently exists and is not altered if any Preset is then further modified or deleted. The last step in preparing a Sensacell panel for “standalone” operation (without the need for an attached PC running SensaSynth2) is to upload the Presets you have assembled into the Preset Queue to your panel using this button. This process erases all previous Presets. A progress bar tracks the upload process and you get the option to navigate to the Play Presets section when done to test the Presets playing back from the panel itself.